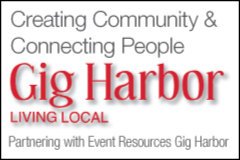 Hi from Betty, your Gig Harbor friend, neighbor and founder of ERGH, your hub for local events and all event resources for the Gig Harbor area. If you know of a business that should be listed or would like to have a blog written about them or an event, simply send me a message (see below for link). Together we can make this a community resource for all. Remember all calendar events, services, entertainers and hosting organizations can be listed for FREE- simply add the listing HERE and assist them by writing a review!